It had been a while since I had last seen Run Lola Run, and watching it this time I was struck by how peaceful moments of the film are. When I had first seen it the film had been declared the culmination of the MTV generation, with cuts so fast that you almost have to have ADHD to be able to understand it. Compared with today’s “action” films, however, Run Lola Run is totally comprehensible in its cinematography. That’s not to say that it’s dull, by any means. It is still a kinetic, exciting joyride of a film, hardly lasting 70 minutes if you discount the credits. It’s a roller coaster ride of the best sort, taking viewers through a fast moving story while providing some existential philosophy and a few heart warming scenes. The plot is fairly simple. Lola (Franka Potente, who later starred in The Bourne Identity) is late to a meeting with her boyfriend, Manni (Moritz Bleibtreu, who would later star in The Experiment). Manni has just messed up an assignment for a group of gangsters. It was supposed to be simple; drop off the goods, collect the cash, and then deliver the money. When Lola wasn’t there, however, he had to take public transportation, and due to a mix up with the authorities the bag of dough disappeared. As a result Manni needs 100,000 marks in the next twenty minutes, or else he will surely be killed. His ensuing phone call to Lola sends her on a race across town, attempting to gather the money and get to Manni before he does something rash. She pleads with her father, a prominent banker, but things do not end up going as well as she might have hoped. Twenty minutes later things end quite tragically. But herein lies the hook of Run Lola Run. The first 25 minutes make a fantastic short film, but then things flip around and Lola gets a second chance to get the money and meet Manni. We see the same events a second time, but slight changes in timing and random encounters take future events down very different paths. Then a third time we see the same sequences, but with more changes and with Lola somehow learning and remembering some lessons from her previous trips. Part of the film’s charm comes from Lola’s random encounters with strangers on the street. As she bumps into an assortment of people we see a sequence of images detailing the remainder of theirs lives, a few years before Amélie [reviewed here] did the same thing. As Lola meets them in the various sequences their individual fates change, raising some interesting questions about the seeming randomness of freak occurrences and their effects on the future. 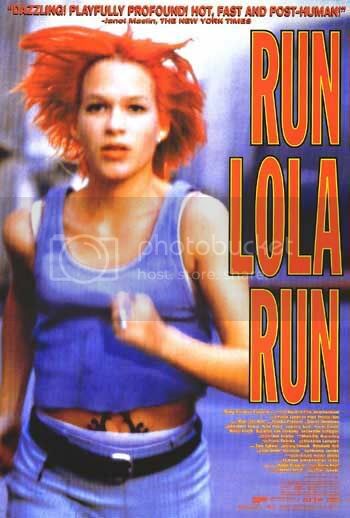 Run Lola Run is a very enjoyable film. It’s short and exciting, as we see the red-haired Lola streak through the streets time and again. Her relationship with Manni is believable and sweet. The slight additions and changes that each subsequent sequence portray add some depth to both the story and Lola’s family. 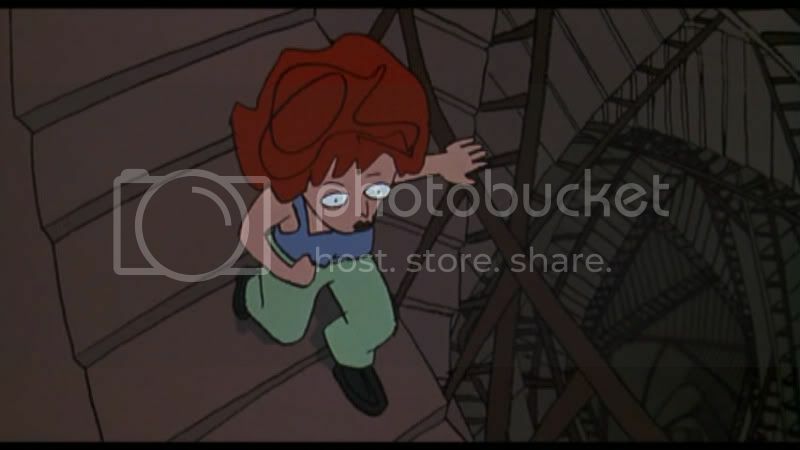 In two of the sequences Lola’s day is worse than just having to worry about her boyfriend being murdered by gangsters. With the strange element of events repeating themselves, it seems that the movie might have some philosophical points to raise about the fleeting nature of time. Perhaps most plainly the lesson becomes “Don’t be late for things, or your boyfriend will die.” In either case, Run Lola is an exciting example of a film born outside the mold. At the same time it offers a few thoughts for the viewer to dwell on. The MPAA rated it “R” for reasons unfathomable, seeing as there is no graphic content and only a spattering of strong language. I would have no trouble recommending it to most people, even younger teenagers. This entry was posted in 3.5 pirate flags, 3.5 stars, Movie Reviews, R on December 12, 2009 by Tim Irwin. Yeah -that’s -what -I’m -talking -about -bab-y-nice -work! All -of -these -articles -have -saved -me -a -lot -of -headaches.